Don't you hate it when you go through your coupons (or coups' as I call them) just to find that you have to throw a bunch of them away for expiring before you could use them? 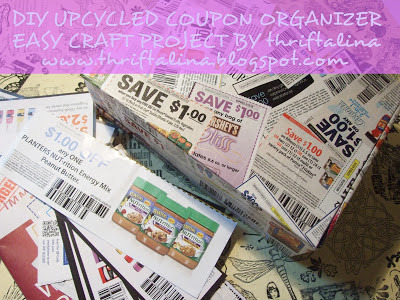 Even if you have been looking for a fun way to keep your 'trading' coupons separated, or keep receipts from shopping trips, rebates, Coupons to be Used...and more from taking over your counters, coffee tables & drawers...I've had this little project finished for a while and with this rainy Northeast weather you may find it a fun way to tackle an organizing chore for one of these days. 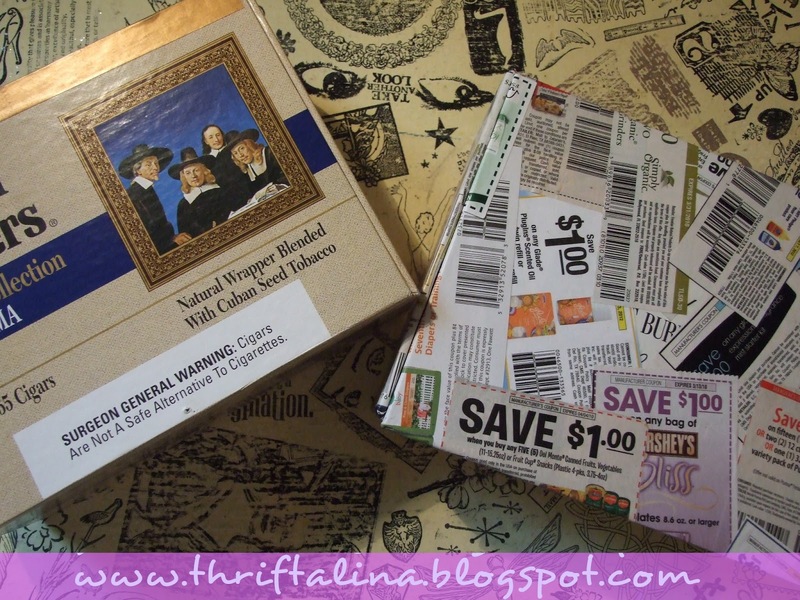 -A Good Coupon Sized Box to decoupage, I used an old Cigar Box but you can use Tissue/Paper Towel Boxes, Gift Boxes, Food Packaging Boxes/Trays, or anything else you can think of! This project is so easy, and it is kid friendly! 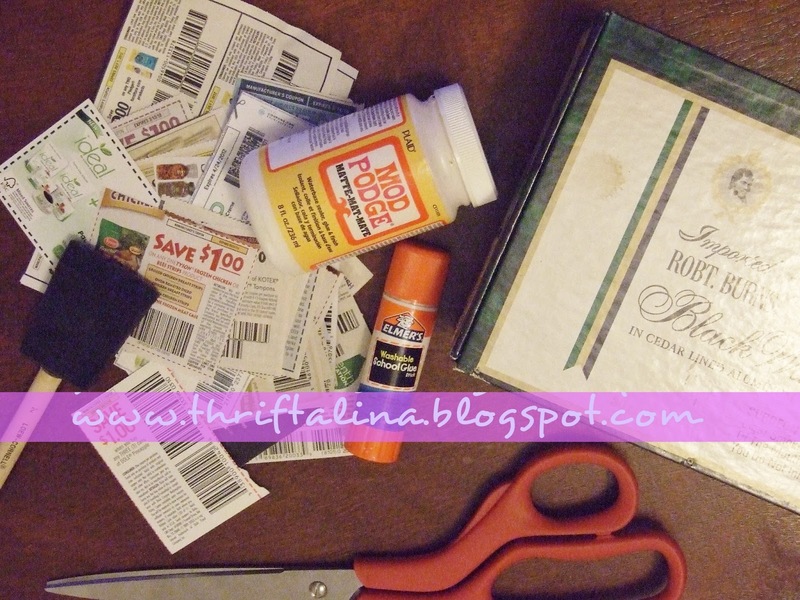 Start by making sure the box you are using is smooth all the way around, you can choose to put a layer of Mod Podge on it and allow it to dry if you feel like it may need some reinforcement or extra smoothness. While you are waiting for it to dry start gathering your coupons that you want to use. I went for as many colorful ones as I could find but you can choose to do it all in black & white too. 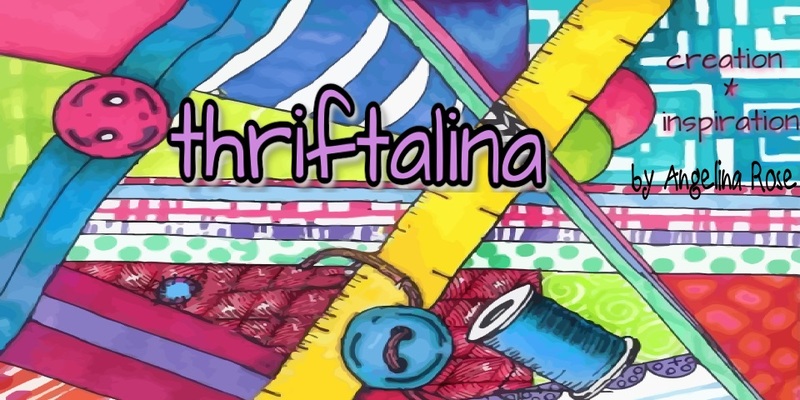 *thriftalina tip - the MORE Coupons you have to use, the BETTER your results will be, it's better to have too many than not enough to cover your entire box here. 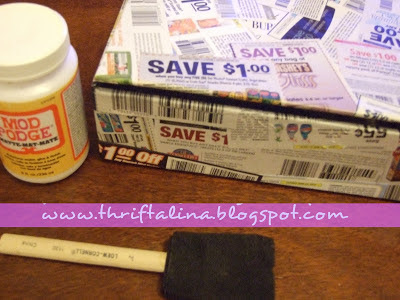 Start gluing your coupons to the box once it's ready, start with your least favorites and overlap them to surround the entire box, it's OK if you have some little spaces in between because you will then glue your favorites around that layer until you have complete coverage. *thriftalina tip - Don't worry if you have to fold a bit of a coupon underneath/around or overlap a part of it, this is what, in the end, makes it look completely collaged, Glue with confidence! Once you are satisfied with your collage work, Use the foam brush to apply generous amounts of mod podge and smooth it all the way around the coupon covered areas. Be sure to keep your coats even and allow them to dry, but feel free to give it as many coats as you like, I think I did about 5 or 6. 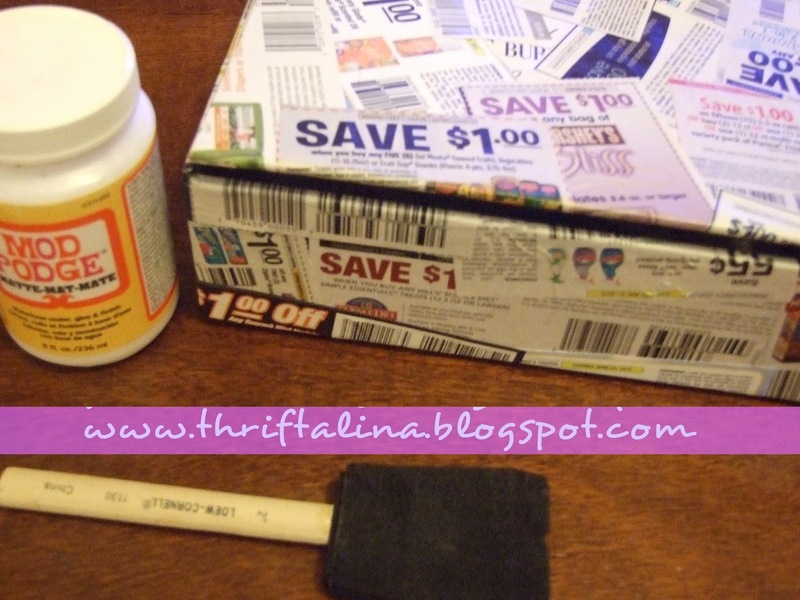 Let your Coupon Box Sit in a dust free place to dry. 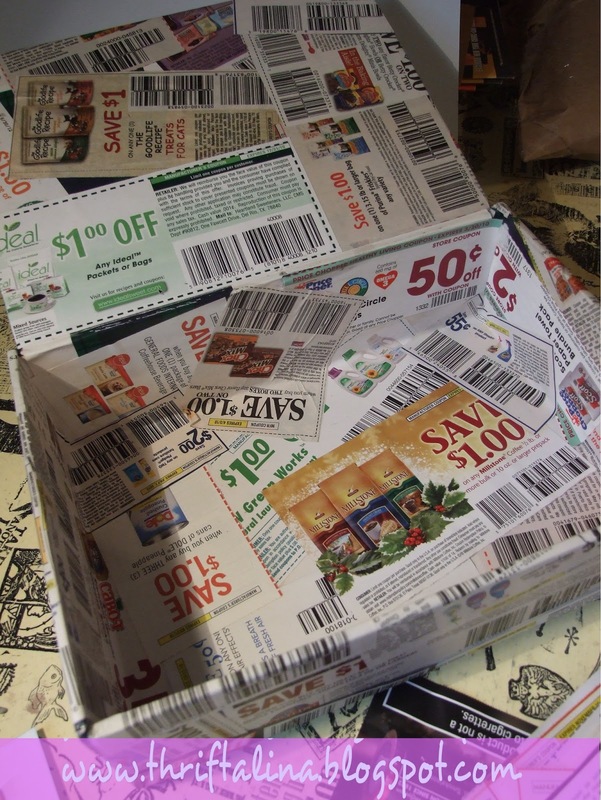 Then you will have a finished storage space for your stray Coupons, Receipts, Rebates & More. Put it where you will remember it, Office, Kitchen, Coffee Table, or Where you Cut Out your Coups & Go through it regularly to clean out any expired items.